WebTuna is an on-demand service for alerting and monitoring the performance of your internet or intranet sites and applications. 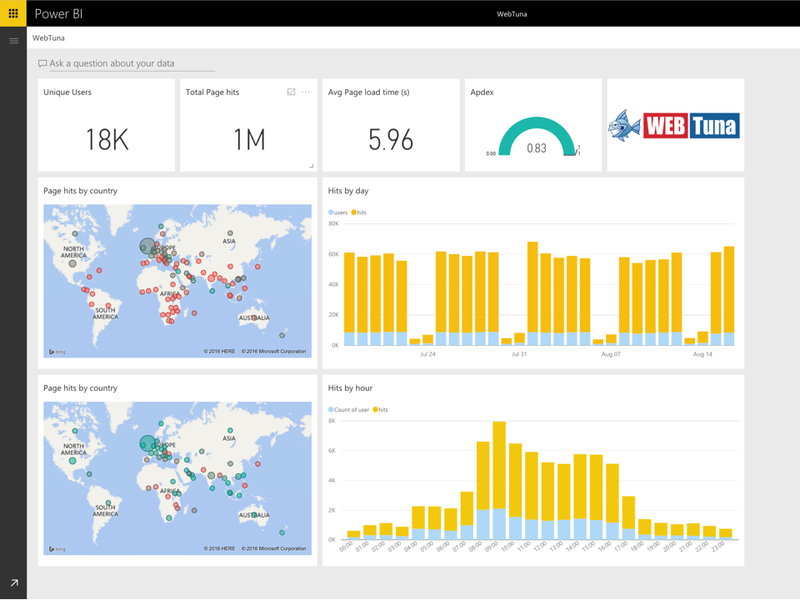 We are excited to announce the availability for a Power BI content pack for WebTuna that focuses on providing deep performance and usage analytics for websites, web applications and intranets. It shows up-to-date interactions for users hitting your sites. To connect to the WebTuna content pack, you simply need to provide your WebTuna credentials. 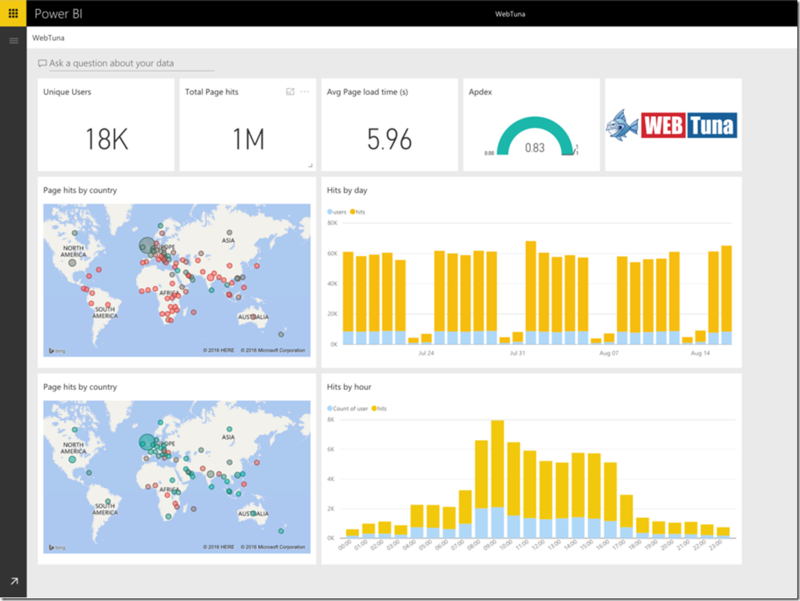 Once the connection is completed, Power BI will automatically create an out-of-box dashboard, report and dataset with data from WebTuna. You can learn more on how to get started on Power BI Help Site. The dashboard is the initial landing page for the content pack and it shows an overview of the key metrics for your site usage. It shows metrics like the number of unique users, total page hits, average load time and a few others. 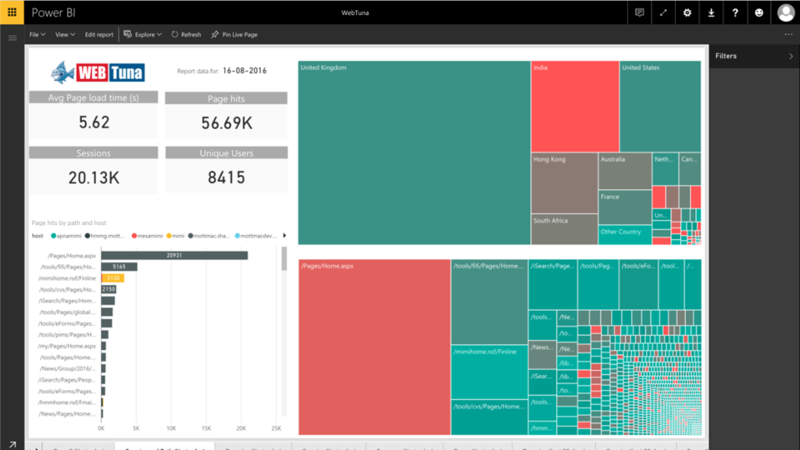 It also shows a breakdown of users hits by country and by day. The report is where you can further explore the data and interact with it. It contains nine pages that shows you plenty of information on your application traffic. It shows detailed site usage data by pages paths, countries, domains and browsers for the day before as well as for the last 30 days. 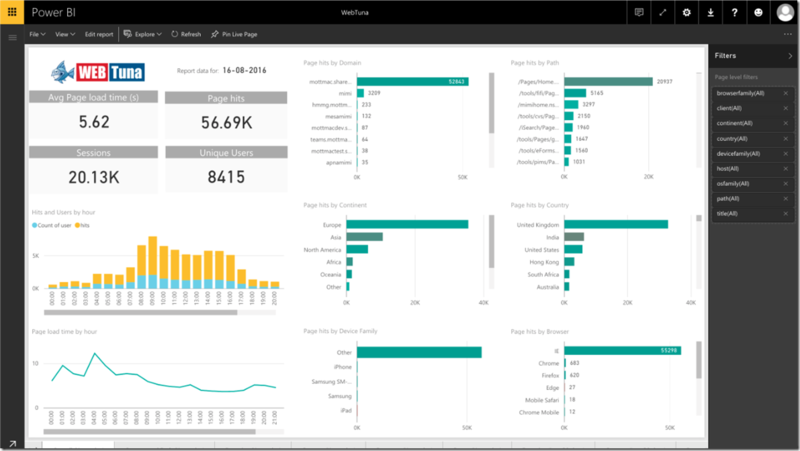 Power BI reports are interactive, so you can interact with the report pages by clicking any data point on any of the charts. This should update the rest of the page based on that selection. You can also apply filters to narrow down the report to find exactly what you are looking for. After the initial import, the dashboard and the reports continue to update daily. You can control the refresh schedule on the dataset. The WebTuna content pack for Power BI provides an initial set of insights on the dashboard and in the reports to help understand your data even further.